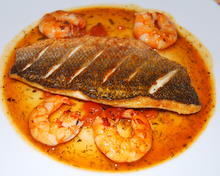 Snapper Recipe From the Mediterranean - Use Sea Bass "Lubina" and Prawns - Shrimp. 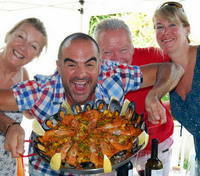 Great Snapper Recipe with Plump Prawns and a special reduced sauce. 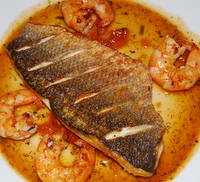 You can use any firm white fleshed fish for this dish - I often use Sea Bass - Lubina in Spain and - Loup de Mer in France. This is about the nearest thing we can get to Snapper here in the Mediterranean. It's important to leave the skin on as the crispy skin contrasts greatly with the firm white flesh and the Juicy Shrimp. 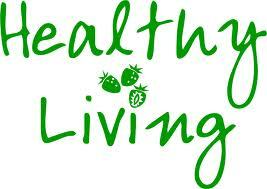 This is a wonderful dish for your Mediterranean Diet. 4 Snapper or sea bass fillets - about 6ozs./150g. each, scaled but skin on. 16 Large prawns (shrimp) shelled - about 1lb./450g. In a small saucepan reduce the wine and vinegar with the shallots until only a few sticky tablespoons remain. Add the honey, dill, salt and pepper to taste. Make 3 or 4 diagonal cuts on the skin of your Fillets - see photo - this will stop them curling up in the pan. Now, medium non stick fry pan fry the fillets -in a little of the olive oil over med/high heat - skin side down - until the skin is crisp and browned. Turn them over and cook for a further two minutes - until just cooked through. Meanwhile - gently fry the prawns in the oil until just pink and cooked through. Now spoon equal amounts of the sauce on to four warm Dinner plates - place your fish fillets on top and arrange the prawns around the plate.